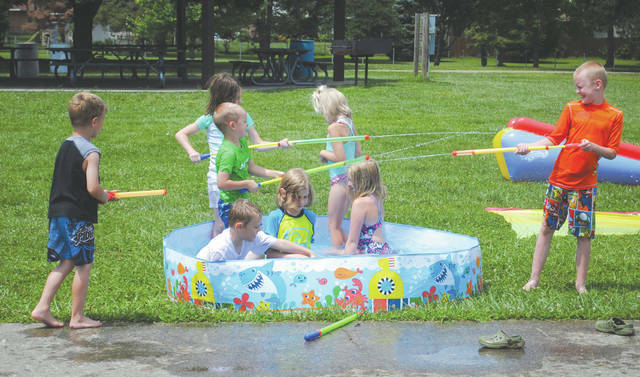 Whitney Vickers | Greene County News Fairborn Parks and Recreation hosted a Water Wipeout camp July 26, inviting local youth to Community Park for slip-and-sliding, water spraying, chalk drawing and more. 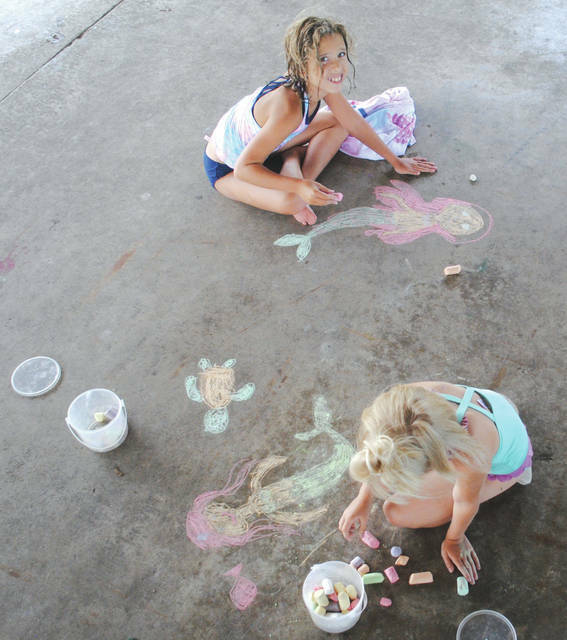 Young Fairborn citizens Sophia Cowen, a second-grade student at Fairborn Primary School, and Kayleigh Kracker, a fourth grade student at Fairborn Intermediate School, took a break from the watery activities to draw mermaids, fairies, unicorns and more with chalk beneath the park shelter. 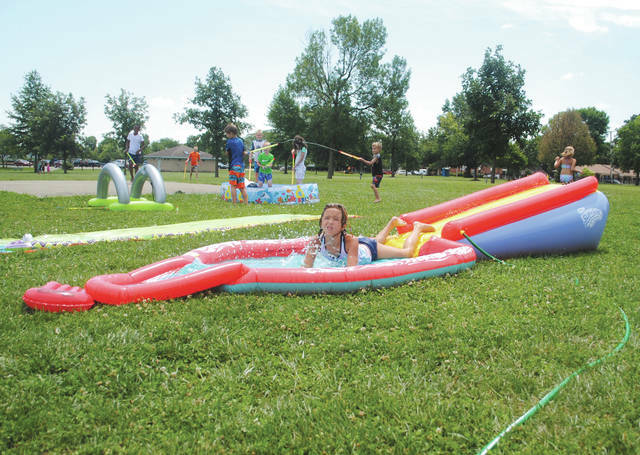 Fairborn Parks and Recreation hosted a Water Wipeout camp July 26, inviting local youth to Community Park for slip-and-sliding, water spraying, chalk drawing and more. https://www.fairborndailyherald.com/wp-content/uploads/sites/50/2018/07/web1_watercamp3.jpgWhitney Vickers | Greene County News Fairborn Parks and Recreation hosted a Water Wipeout camp July 26, inviting local youth to Community Park for slip-and-sliding, water spraying, chalk drawing and more. https://www.fairborndailyherald.com/wp-content/uploads/sites/50/2018/07/web1_watercamp5.jpgYoung Fairborn citizens Sophia Cowen, a second-grade student at Fairborn Primary School, and Kayleigh Kracker, a fourth grade student at Fairborn Intermediate School, took a break from the watery activities to draw mermaids, fairies, unicorns and more with chalk beneath the park shelter. 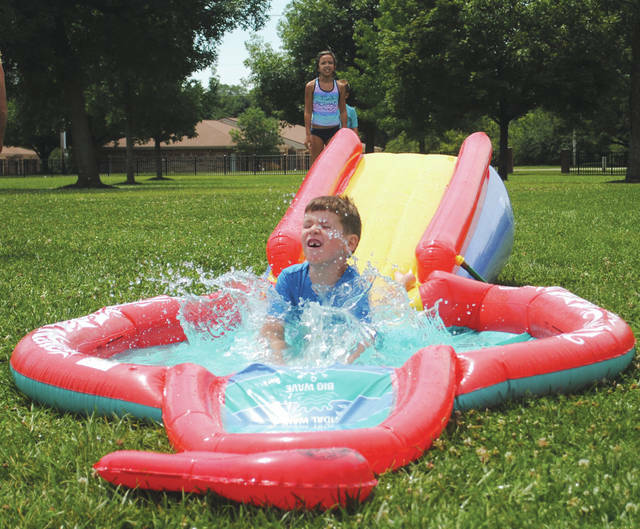 https://www.fairborndailyherald.com/wp-content/uploads/sites/50/2018/07/web1_watercamp2.jpgWhitney Vickers | Greene County News Fairborn Parks and Recreation hosted a Water Wipeout camp July 26, inviting local youth to Community Park for slip-and-sliding, water spraying, chalk drawing and more. https://www.fairborndailyherald.com/wp-content/uploads/sites/50/2018/07/web1_watercamp4.jpgWhitney Vickers | Greene County News Fairborn Parks and Recreation hosted a Water Wipeout camp July 26, inviting local youth to Community Park for slip-and-sliding, water spraying, chalk drawing and more.